There's nothing I can really put into words about how I feel about your project, we've all felt loss, and your film speaks to me, especially with my two brothers gone within the last 12 months, perhaps that explains why I feel it necessary to champion your film, and your cause, simply put mate, you and what you've done for the independent film sector, across the globe, speaks louder than words. As they say a lot of people talk about what they're going to do, I admire the fact that you're doing it rather than talking about it, and you're dragging every independent film maker along with you, you're encouraging, you're inspiring, you've made the process bigger than just you, you've made it into something for everyone. As they say, it's not how high up the ladder you go, it's how many people you take with you... You talk about 'having the audience' and giving them something, mate you had an audience with bated breath since you released your first book, and said that film making was bigger than money, it was about a truck load of determination, guts and the ability to tell a story that has heart! We're all following your story, and we all believe in what you're doing. Courage mate, you'll get what you want, I know it. Carpe Diem and Carpe Noctum! Seize all of it! I produced and edited the short film BILL, which was also at RIIFF this year. Since I was unable to go to the festival, I naturally scoured the web for coverage of it - which is how I came across your blog. First, I want to congratulate you on your huge win. 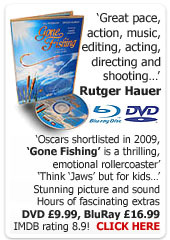 Gone Fishing looks great, it played beautifully and I really look forward to seeing it! But I also want to thank you for your excellent coverage of the fest. Your videos were perfectly put together, fun to watch and they really captured the feeling of the festival, as well as great specific moments. Even though we couldn't make it out there, at least we could see what we were missing. CONGRATULATIONS CHRIS!!!! You're a shining example of British movie making as it SHOULD be!!!!! I can't congratulate you enough on yet another award for Gone Fishing! As an aspiring writer and director (in my first year of a three year plan to become a respected movie maker) the information, both video and text, you publish on your blog has been so very a) interesting, b) useful and c) inspirational. Watching the video blogs over the last few weeks has made me feel like I'm with you and the team on the Gone Fishing journey. I was biting my nails as I sat and watched your latest video entry... on the edge of my seat! Just to see you doing your thing and getting ahead is uplifting and of course amazing. In fact I am not ashamed to admit I have shed a tear at the round of applause the audience give at the end credits got after the showing of your film on the last night. Your webisodes make me feel I am there with you all. Wishing you and your team all the best of good Irish luck in world and I'll keep watching - someone try and stop me! Your web blogs are an amazing extension of the contagious energy! It's a whole other story to watch! Thank you once again for such a movement! The energy is seriously progressive... I have a phrase I now use in my new seriousness and commitment to telling stories...'Move on Movers'. To sum it up...it is extremely contagious to see and feel such excitement coming from such movers as yourself. And that my friends, is what pushes forward the passions of other movers. Thank you... So, thank you for the wonderful gift. I will keep heavy eyes out for more of your work! My energies are with you both and your team for many, many more great things to come. Congratulations. You said on your blog... "It’s just that most of the time in the UK, we spend too much energy chasing the dangling carrot of Film Council money or other ‘free’ money, and neglect the whole point of what we do, specifically telling stories that really move audiences." God, yes. Bloody well put. We need to keep saying that to new filmmakers, and often. And congratulations on all the success with Gone Fishing. Well-deserved. It was such a pleasure to meet you and to experience, not only your Award Winning film, but your thoughts and ideas on great filmmaking. Thank you for the encouragement and CONGRATULATIONS on your big win at RIIFF, although I had already called that one on Opening night, that's right, roll the BLOG tape, proof of my prediction! Can you believe I won the Directorial Discovery Award? AMAZING! Congrats again and I look forward to working with you all again, good luck on the Oscars, I'll be cheering for you! What a fantastic journey you've had to Rhode Island, these words really come from heart as I'm fighting back tears here, tears of joy for you and all the people who worked so hard on Gone. The film is not only the only thing that touches people and reaches out for them, your journey does. It's a wonderful dream that we're all living with you - Living Spirit never seemed so apt. Thank you so very much. Where's me hanky!!? Being able to watch the webisodes is great for me, since I cannot be there to enjoy the ride. I appreciate enormously that you take the time to record them and to post your comments dutifully even when you are extremely tired. I am sure Gone Fishing will get a nomination for the Oscars, and that down the road you'll harvest many more awards. I feel like all of us involved in Gone Fishing in whatever capacity are travelling on a big, merry train, and that you are the driver; well, let me tell you we are enjoying some wonderful vistas! Take it easy man, and enjoy the ride! Congrats for the award! Such fantastic news regarding the film. CONGRATULATIONS!! I have been telling my friends about you from the beginning and they are so pleased for you, and the recurring comment I get is along the lines of "that's great because he is one of the good guys, making films with passion for all the right reasons." You are showing them all that it can be done and we don't have to keep going back and forth to screen agencies with our cap in hand. You are an inspiration to all. Chris Jones, the “Ray Mears” of independent film. It’s one thing to say “go shoot a movie” and write a book on how to do it. It’s another thing to actually teach a course and directly inspire people to “go shoot a movie”! It’s a total mind screw to “go shoot a movie”, tell the world it’s going to the OSCARS and then pull it off! I’m not sure which is the greater story, GONE FISHING or CHRIS JONES GOES FISHING! Maybe it should be CHRIS JONES WENT FISHING and brought back enough fish to feed the 5000! Your focus, drive, energy, leadership, self belief, networking skills and political shrewdness have been your torches, your passion your compass, and your commitment to the goal your net, if you keep going on like this and people will be calling you a mystic! Mystic or not, as I wrote a number of years ago, you are indeed a pathfinder, one of the best I’ve ever met and you have shown the road to the promised land is real. Even more to your credit you’ve done it by taking everyone along with you for the ride.A lesser man would have gone it alone. A lesser man would have gone home. A greater man would have gone fishing, and you did! Horrahh, Horrahh for Chris the Fish! I saw Gone Fishing when it screened in the Kodak shorts - so was interested to see your blog that came up on Shooting People. I remember that in the acceptance speech at Rushes there was a 'here's the frst step to the Oscars' type line - so wanted to say a big CONGRATULATIONS to you for achieving that by winning at Rhode Island. Nice one!! So the Kodak Screenings have begun, and yesterday I attended the afternoon screenings and we made this short video here. I am attending again today, and will be there during the week at various points too. If you can make it, we would love to see you there. UPDATE.. 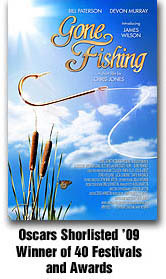 I just found out that fellow Gone Fishing'er Martin Gooch (who did a pass over the script) also has a film playing, not in the Kodak section, but the main Rushes Festival part - it's called 'Where Do All The Missing People Go' and is sure to be a cracker, so try and make time to catch it too. It's palying on the 30th at 3pm at the Curzon Soho, and Thursday 31st at Soho House, 21 Old Compton Street. The Kodak 2008 Awards are now underway, and we need your help and support TO WIN with ‘Gone Fishing’! Gone Fishing is down to the final 8 films, and the best film is an audience award. So, we need you and EVERYONE you know, to get to a screening and vote for our movie. Most of the screenings will be attended by either myself and / or producer Ivan Clements, and of course we would love to see you there, we might even buy you a drink! I am just preparing Gone Fishing for the Kodak Awards. Sadly, the film can only be screened on DigiBeta, which is much lower resolution than the HDCam or 35mm copies we could have used. This is a pragmatic choice on behalf of the festival organisers and Kodak, as not all of the films being screened are on such high quality formats, and it makes it easier for the projectionist if everything is on one tape – press play and forget about it. 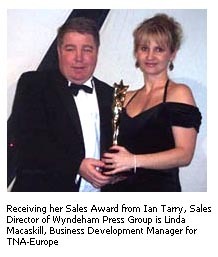 I understand this, but it’s frustrating, especially as it’s a Kodak award! So Gone Fishing will only be on DigiBeta. Making the DigiBeta should in theory have been quite easy, but as we shot 24fps, we needed to re-speed the sound and also down-convert the HDCam picture to standard definition. With a budget, all of this would have been easy. And so I have been messing around with file conversions and I hope to do a transfer tomorrow with a friend at a post production facility, somewhat under that radar so to speak. I have had to pay particular attention to the sound as I needed to make a stereo mix from the six track mix I was given, and also tweak it for a less theatric sound system, by making the quieter sections a little louder. I just can’t assume the sound system in the venues will be top notch, and the last thing we need is the audience not actually hearing the sound properly. This highlights one of the things I talk about on my courses, that post production kind of never ends, there is always a new version of the film to make up, for some unique event or sale. Nevertheless, I am still very excited about the Kodak awards! Hoorah! We also just heard that we have been selected for the Rhode Island International Film Festival. This is an important one as Rhode Island is a qualifying festival for the 2009 Oscars – if we win there, we are definitely eligible for nomination for the Oscars.